The Himalayas—which began forming about 50 million years ago when the Indian subcontinent started to collide with Eurasia—are arguably the world’s best-known snow-capped mountain range. 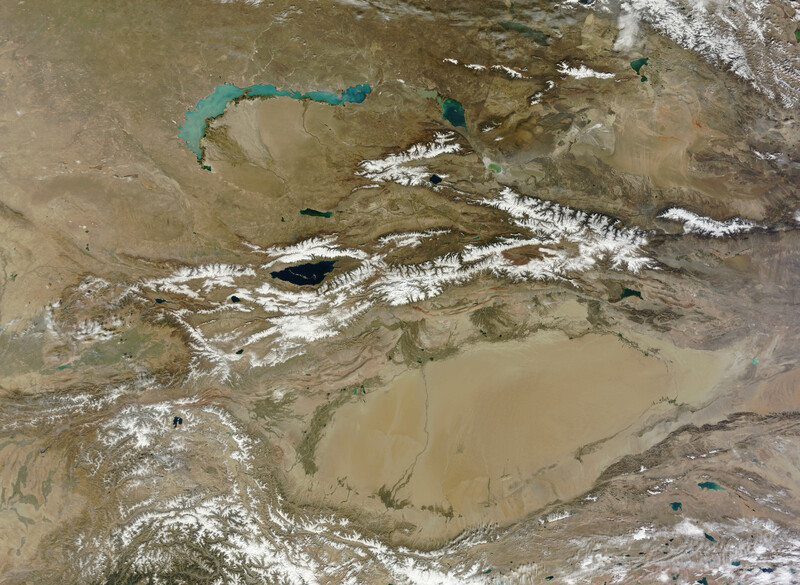 But just to the north, beyond the Tarim Basin, the same tectonic forces that built the Himalayas also produced the Tien Shan, a similarly vast range of snow-capped peaks that extends 2,500 kilometers (1,500 miles) through Uzbekistan, Tajikistan, Kyrgyzstan, Kazakhstan, and western China. 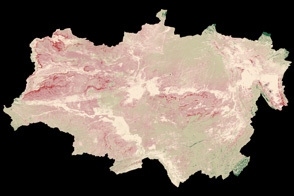 Geographers usually divide the Tien Shan into western, northern, central, and easterm ranges. The western and northern ranges have a milder and relatively moist climate, while the central and eastern ranges have a more severe climate, characterized by frigid winters and searing summers. Many parts of the Tien Shan are cold enough to sustain glaciers. Some of the highest peaks and largest glaciers are clustered in the central range east of Lake Issyk-Kul, the large salt lake near the center of the image. Although the lake is surrounded by snow-capped mountains and situated at a high altitude, it does not generally freeze because of its high salinity. Tien Shan’s glaciers play a crucial role in Central Asia’s hydrological cycle. An estimated 15 percent of freshwater runoff in Kyrgyzstan comes from glaciers, and the contribution can be much higher during the melting season, according to an analysis published in October 2012. In the summer especially, cities such as Almaty, Bishkek, Tashkent, and Ürümqi rely heavily on freshwater from glaciers for irrigation and for household consumption, according to Annina Sorg, the Bern University researcher and lead author of the 2012 paper. 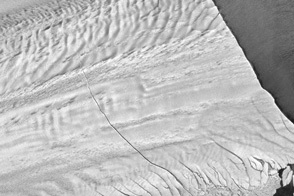 Based on a review of numerous studies, she concluded that Tien Shan’s glaciers have retreated in recent decades due to changing climate conditions. 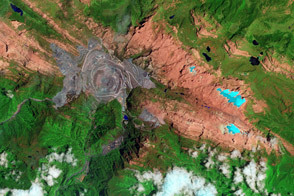 NASA images courtesy LANCE MODIS Rapid Response Team at NASA GSFC. Caption by Adam Voiland. Glaciers on Tien Shan, a long mountain range that runs through central Asia, serve as a key source of freshwater for cities in the region. Sorg, A. 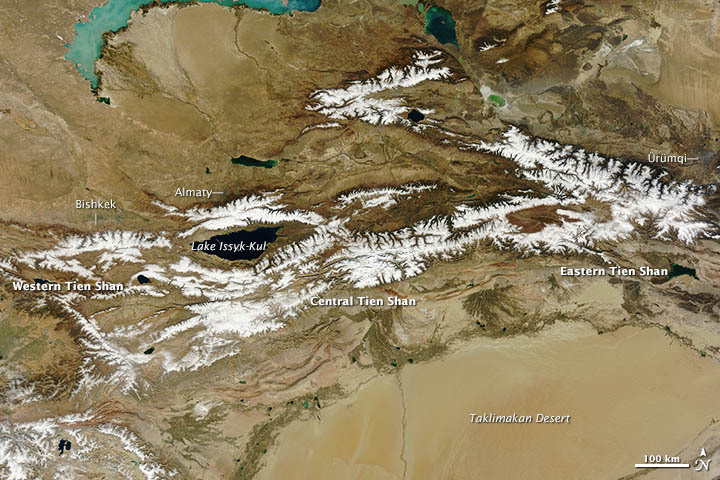 (2012, July 29) Climate change impacts on glaciers and runoff in Tien Shan. Nature Climate Change. Eurekalert (2012, July 29) Researchers analyze melting glaciers and water resources in Central Asia. Accessed Oct. 16, 2012. European Space Agency (2011, Dec. 9) Earth from space: bumpy borders. Accessed Oct. 16, 2012.